Things have changed over the years and now it’s not so abnormal to hear of people studying from home or working from home. Both are very viable ways in which to get ahead in education and careers and we are here to tell you that if you have the opportunity to study from home or work from home, grab it with both hands. You are worth it. Working from home and studying from home will provide you with a world of opportunities that you won’t ever get to enjoy if you are chained to a desk working for someone else or trapped in a classroom at the local university. Most people have the idea that studying requires official enrolment at an institution and set study schedules where integration and participation with other students is compulsory. You have to travel to and from classes which costs money and quite frankly, puts your life at risk (especially with hijackings and accidents on the rise). There’s also the distraction of other students and not being able to study at your own pace. Quite simply put, your time is not your own. When you study from home, the shackles of education fall away. You can study your course according to your own schedule and that means that if you get your classes and assignments done and want extra personal time, you can have it without asking. It also means that you save on the cost of transport, your life is safer and you don’t have to put up with other students holding the class back. Your time is your own and how well you do is completely up to you. When you work for someone else, at their premises, you are a slave to the system. Not only are you helping someone to build their own empire, but your free time, earning potential and creativity are all dictated. By working from home you can cut back on transport costs, be safer (it’s all about those hijackings and accidents again), and you can potentially even help other unemployed people earn a living, if your business grows to its full potential. Working from home cuts out the costs associated with starting up a brand new business and it also means that you don’t have forego your current lifestyle in order to earn a living. Imagine being able to earn a living while still helping the kids with their homework and spending time with the family. Sounds like a dream, doesn’t it? Well, that dream can be a reality, if you take the plunge and work from home. 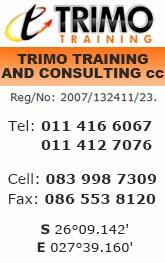 At Trimo Training we offer courses that can be studied at home. We also offer small business courses that can help you to learn the skills required to start your very own home-based business. If you want to find out more about our courses or what it takes to successfully run a work-from-home business, get in touch with us via email or telephone at Trimo Training today.